Cologne Express Library « Cologne, Minnesota | A great place to Live, Work and Grow! The Cologne Express Library is operated through the Carver County Library system. Materials can be requested online with a Carver County Library card and when the item is available, it will be delivered to the Cologne Express Library location for pickup. The Express Library is located in the south entrance to the Cologne Community Center. Access hours vary. The front doors are unlocked from 8am-4:30pm, Monday through Friday. Additional access hours may be obtained by filling out the City of Cologne Express Library Application and using your free Library Access Card. Fitness Club members are also able access the Express Library 24/7. Items may be returned at the on-site drop off location, or at any other Carver County Library. 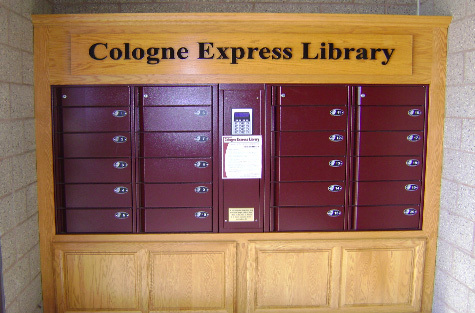 The Cologne Express Library is managed by the staff at the Waconia Library. You can contact them at 952-442-4714 or go to the Carver County Library website for more information. CLICK HERE to download a Cologne Express Library Brochure for even more information!